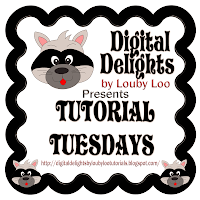 It's Tutorial Tuesday at Digital Delights with Deanne, who will be showing you how to make a card holder and matching cards. Take a look, it's fab. There's still plenty of time to enter the challenge at Delightful Sketches #11. There's a fantastic prize of a stamp set from The Greeting Farm.